Two big examples of problematic self-government are upon us. They are of course the possible partial shutdown of the federal government, following the long-running hamstringing of public functions via "the sequester"; and a possible vote not to raise the federal debt ceiling, which would create the prospect of a default on U.S. Treasury debt. As a matter of politics, this is different from anything we learned about in classrooms or expected until the past few years. We're used to thinking that the most important disagreements are between the major parties, not within one party; and that disagreements over policies, goals, tactics can be addressed by negotiation or compromise. This time, the fight that matters is within the Republican party, and that fight is over whether compromise itself is legitimate. ** Outsiders to this struggle -- the president and his administration, Democratic legislators as a group, voters or "opinion leaders" outside the generally safe districts that elected the new House majority -- have essentially no leverage over the outcome. I can't recall any situation like this in my own experience, and the only even-approximate historic parallel (with obvious differences) is the inability of Northern/free-state opinion to affect the debate within the slave-state South from the 1840s onward. Nor is there a conceivable "compromise" the Democrats could offer that would placate the other side. As a matter of journalism, any story that presents the disagreements as a "standoff," a "showdown," a "failure of leadership," a sign of "partisan gridlock," or any of the other usual terms for political disagreement, represents a failure of journalism*** and an inability to see or describe what is going on. For instance: the "dig in their heels" headline you see below, which is from a proprietary newsletter I read this morning, and about which I am leaving off the identifying details. This isn't "gridlock." It is a ferocious struggle within one party, between its traditionalists and its radical factions, with results that unfortunately can harm all the rest of us -- and, should there be a debt default, could harm the rest of the world too. * The FAA, the FDA, our research organizations, all other public programs from monitoring air quality to modernizing computer systems to staffing the military -- they're all wasting time and money now because of indiscriminate "sequester" cuts and preparations for possible shut-down. For the foreseeable future, the air traffic will keep moving and other functions will go on -- just more stupidly and wastefully. We have that much social capital still to burn. But: As the WaPo points out, flood relief for Colorado is already being delayed because of shutdown threats. Just within the past week I've heard from people in the scientific establishment about researchers they've had to lay off because of stop-and-start funding; from people in the aviation world about safety upgrades that are being delayed; from someone working with the IRS about a postponed computer upgrade; from diplomats about delayed visa processing; and on through a long list. It's survivable, but it's stupid, and eventually we use the margin up. ** The debt-ceiling vote, of course, is not about future spending decisions. It is about whether to cover expenditures the Congress has already authorized. There is no sane reason for subjecting this to a repeated vote. And there is no precedent for serious threats not to honor federal debt -- as opposed to symbolic anti-Administration protest votes, which both parties have cast over the years. Nor for demanding the reversal of major legislation as a condition for routine government operations. In case the point is not clear yet: there is no post-Civil War precedent for what the House GOP is doing now. It is radical, and dangerous for the economy and our process of government, and its departure from past political disagreements can't be buffed away or ignored. 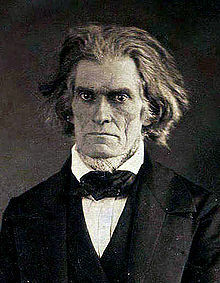 If someone can think of a precedent after the era of John C. Calhoun, shown above in Mathew Brady's famous portrait, let me know. *** For examples of coverage that plainly states what is going on, here is a small sampling: Greg Sargent, Derek Thompson, John Gilmour (on why Ronald Reagan believed in compromise), Jonathan Rauch, Brian Beutler, Jonathan Chait, Andrew Sullivan (also here), Ezra Klein and Evan Soltas, Dan Froomkin. On today's Diane Rehm show News Roundup, panelists Ruth Marcus, Janet Hook, and Todd Purdum all said with a bluntness unusual for a D.C.-based talk show that we are witnessing the effects not of gridlock but of one party's internal crisis.